Why Surge Protectors Are Necessary for Your Home and Business | Hi-Lite Electric Inc.
Electrical surges are impossible to predict, but the damage they cause is mind-boggling. Your entire facility’s technology can be shut down or ruined in less than a thousandth of a second. The investment in building systems, one of the biggest expenses in running a large facility, is immediately scrapped. In less than a moment, thousands of dollars have gone up in smoke. How Can a Surge Protector Help? The best way to protect your system from an unexpected and devastating jolt is to use a surge protector. A surge protector is a device designed to protect electrical devices from voltage spikes. Running more voltage through any device than it can handle can destroy it, leading to greater system failures. Surge protectors either block the extra voltage or re-route it to the ground. Power strips are not the same as surge protectors, a fact which many in the security industry are painfully unaware of. A power strip simply connects multiple devices, while a surge protector prevents any one of them from being overloaded with voltage. The power of a surge protector is measured in joules. 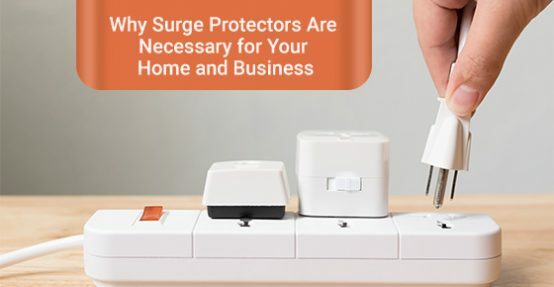 Depending on the size of your facility, number of devices, and extensiveness of your systems, your surge protector needs will vary. Here are three reasons why surge protectors are essential if you want to safeguard your facility, your investment in technology, and ensure that operations continue to run smoothly in all circumstances. Surge protectors safeguard your devices from two scenarios: power spikes and power surges. A power spike is when voltage running to your devices elevates for a short period of time, perhaps a fraction of a second. A power surge is a more serious event. These can be attributed to a variety of causes such as faulty wiring, lightning strikes, or a sudden change in current. Spikes and surges are impossible to predict, and because electricity acts to rapidly, it can do a great deal of damage before you even blink. Surge protectors ensure your investment in technology won’t be wasted. Installing technology systems in your facility without also installing surge protectors leaves you open to system failures and loss of stored data. These things are too valuable to leave vulnerable. The larger your facility grows, the more technology systems you need to keep relevant and competitive. The more technology systems you implement, the more you need surge protectors. If you have one laptop plugged into the wall, replacing it would be a headache but not a catastrophe. If you’re running a factory with integrated security systems, automated item processing, and ongoing data monitoring, your liability skyrockets. Technology continues to advance, requiring business owners to make continual investments to ensure they remain competitive. Most business owners are not technologists, however, and don’t realize the ability of power spikes and surges to undermine their entire business. The larger your operation grows, so does your need for surge protectors. A small investment saves your main one. The cost of building a business requires most entrepreneurs to take out daunting loans. For most, it can be years of being in business before seeing a return on investment. The initial costs are so great that many businesses never make it back into the black. Power surges and spikes can double this financial burden. If lightning strikes, your systems blow, and you need to start from the ground up. The cost of replacing all electronic equipment in the average home is $8,000. This figure can easily rise to $20,000 or more if the home has sophisticated electronic systems in place. If you are a business owner, this cost will be exponentially higher depending on the size of your facility and the extent of your electrical systems. This is a loss that most home and business owners can’t afford. The minimal cost of a surge protector offers an immense return on investment. If a surge protector negates a power surge, you’ve saved yourself an immense amount of money, and possibly your entire business. Power surges and spikes aren’t fair; they can’t be predicted, they act fast, and the results devastate carefully implemented technology systems. It takes only a small investment and a quick installation to ensure that this doesn’t happen to you. Surge protectors are a necessity for anyone who needs to protect their technology systems, which in this day in age pertains to every business. When securing your facility from power spikes and surges, allow experienced professionals to do the job. You’ll sleep easy knowing that your surge protectors have been correctly put into place and the business you worked so hard to build won’t be wrecked by a wanton surge of electricity. Hi-Lite Electric Inc. has been in business for over 35 years, and we’ve assisted thousands of clients in lighting up their day. For more information, call us at 416-800-5523 or contact us here.